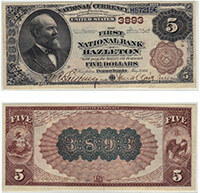 These are twenty times rarer than original series $1 territorials. The prices they command don't always seem to reflect that rarity though. The price of any note is based on the rarity of the bank and the condition of the bill. Please contact us for details. Don't forget to check the serial number. Number 1 notes always sell for nice premiums.